It is all 'doom and gloom' in the financial markets. Mr Market is having one of his manic depressive phases, where anything can happen. The computer 'trading robots' - which make up the bulk of trading - are magnifying the swings in sentiment. But here's the thing: a global financial meltdown is just not going to happen. We may be entering a period of great uncertainty, coupled with high-ish inflation but for DIY Income Investors, the best thing to do might be - do nothing! 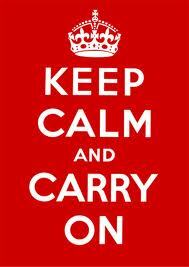 As the war-time poster said: Keep Calm and Carry On. Some of the politicians aren't helping much - like Vince Cable: I wonder when is he going to be shown the exit; I'm pretty fed up with his negativism and 'bank-bashing'. Although I am astonished at some of the salaries and bonuses that continue to be paid to (some of) the bankers, our income tax system is pretty aggressive now and this continuous sniping is unsettling to the markets. Anyway, for a DIY Income Investor the important thing is the on-going income stream from your investments: the cash interest, dividends and bond/gilt coupons. Of course the capital value is important but we must take a longer-term view: if the markets recover over the next couple of years, then the share prices of good, well-funded companies and banks should recover. Also, being invested in fixed-income securities is a great stabiliser - as long as the institutions don't go 'belly up' - which I can't see that they will, in the UK at least. because of the large share of public investment. As China is finding out with its US investments: you can't be too nasty to someone who owes you a lot of money. Chris Dillow in the Investor's Chronicle has a well argued piece about why most of us should do nothing! One of the 'benefits' of these gyrations in value is that we learn about our own appetite for risk. Perhaps what is more appropriate now is to load up with some nice income-producing bargains - at this time in the sentiment cycle these are more likely to be high-yield dividend shares, rather than bonds/gilts. The fixed-income securities have been a magnet for the money sloshing around the financial system (thereby driving up prices and reducing yields). There may even be a case for selling some of these on the current high prices. Do you agree? If so, happy hunting! I've been topping up my holdings in RSA, AV. and AZN. Not only have I picked up more high dividend paying shares, but I've reduced the average price I've paid for these quality shares. That's good. Don't forget to diversity and check the latest dividend yields.